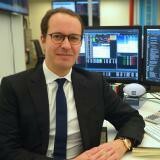 Quentin Limouzi is TS chief revenue officer. Quentin is responsible for defining and implementing TS’s sales strategy, globally defining segments, product reach, targets and budgets. He also oversees TS’s client-facing group, but personally manages global sell side partner relationships and top client accounts. Limouzi presides over the TS graduate program and marketing delivery. He rejoined the firm in 2015 as global sales chief operating officer in Tokyo. Limouzi spearheaded TS client-facing business in Asia from 2003 to 2007 and launched its Hong Kong office. He started his career at TS as a new graduate in London in September 2002. Limouzi has 15 years of experience in the electronic execution space. Prior to rejoining TS, he headed execution sales and coverage in Hong Kong for Asia Pacific at HSBC Securities. He held a similar position at BNP Paribas for Asia Pacific from 2007 to 2013. Limouzi holds a masters degree in management from EM Lyon and a bachelor’s in economics with an emphasis on quantitative analysis techniques from Universite Jean Moulin Lyon III. Check out the incredible speaker line-up to see who will be joining Quentin.